ColorPic is the Free Professional Color Picker. Powerful color adjustment tools let you change individual colors with ease. Adjust RGB, Hue, Saturation and Color Values with four graphical mixers. View CMYK printing colors. Use the screen magnifier for perfect accuracy. 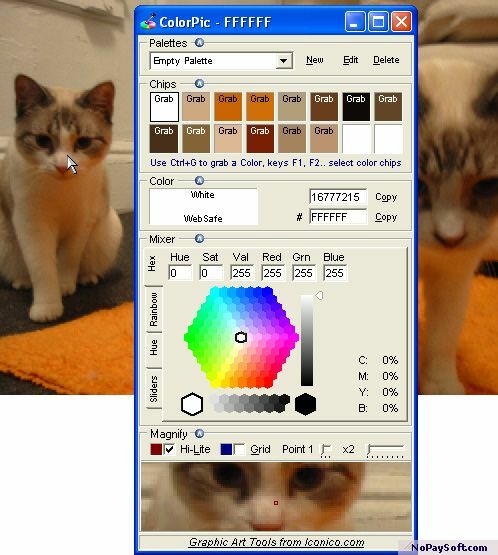 Save multiple palettes of colors for use in any application. Invaluable for any graphic designer or web developer, ColorPic is the most popular free color picker on the web.